Specificity/Sensitivity: Caspase-9 antibody is predicted to have no cross reactivity to other members in the caspase family. 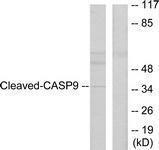 Specificity/Sensitivity: Caspase 9 (Cleaved-Asp353) Antibody detects endogenous levels of fragment of activated Caspase 9 resulting from cleavage adjacent to Asp353. 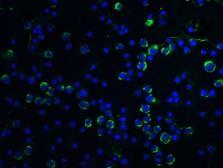 Specificity/Sensitivity: The antibody detects endogenous Caspase 9 protein. Specificity/Sensitivity: This antibody recognizes only the cleaved caspase 9 (37 kDa). 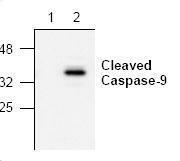 It does not recognize full-length caspase 9 or any other caspase. 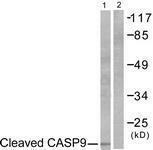 Specificity/Sensitivity: Caspase 9 (Cleaved-Asp330) Antibody detects endogenous levels of fragment of activated Caspase 9 resulting from cleavage adjacent to Asp330. Specificity/Sensitivity: Caspase 9 (Cleaved-Asp315) Antibody detects endogenous levels of fragment of activated Caspase 9 resulting from cleavage adjacent to Asp315.